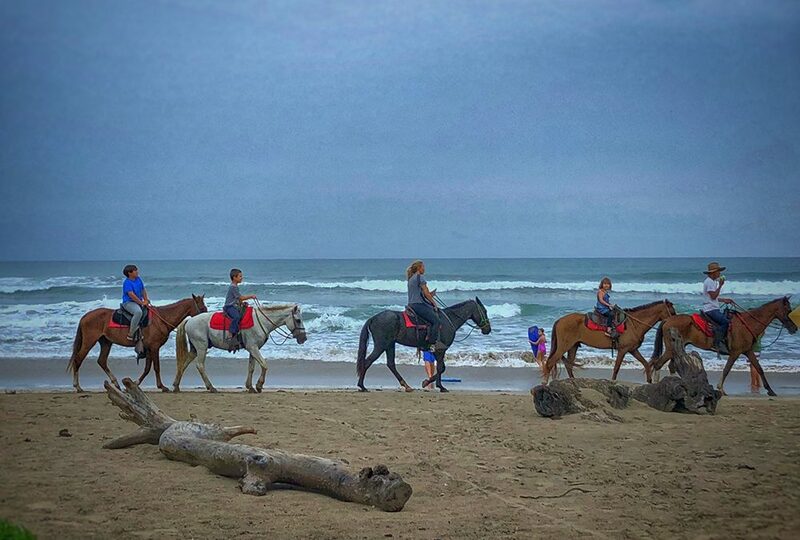 Nosara, Costa Rica couldn’t be a more charming town. Are you picturing dirt roads, small boutiques and little cafes, all within walking distance to a wide stretch of beach? Look no further than this Costa Rican town. And since food is one of my favorite subjects, our priority was finding where to eat in Nosara! 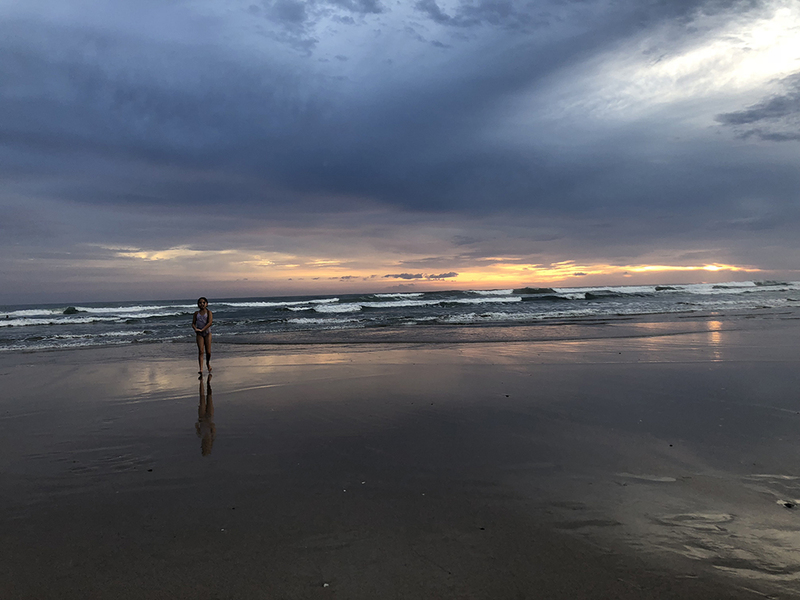 Nosara is both a village and a district on the Nicoya Penninsula and encompasses several beaches and the town of Guiones, as well. The official town center, called “Nosara Town” is tiny and doesn’t have much. Guiones and Pelada are the main tourist hubs and have the majority of the restaurants, boutique hotels and coffee shops. 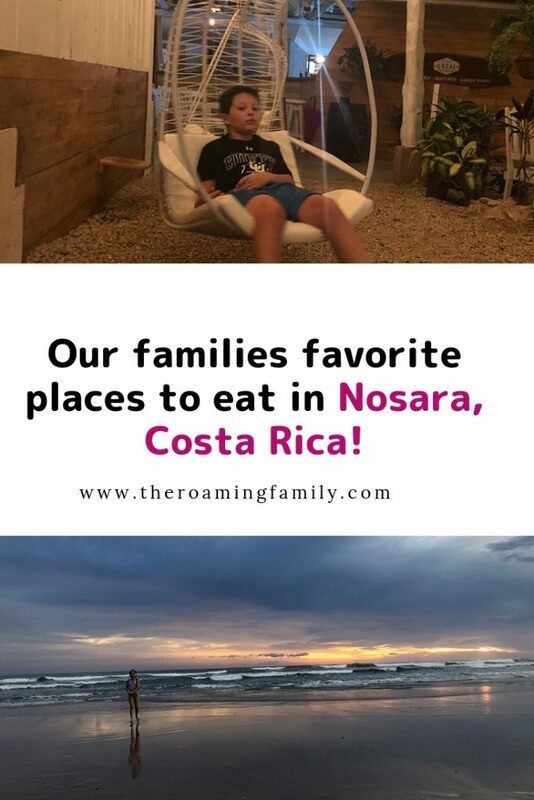 During our time in Costa Rica, we spend the majority of our time there. Everything is very compact and quaint and you can even rent a golf cart to get around – it’s fantastic. Is there anything better than enjoying a coffee and seeing a monkey scamper across you path? There are plenty of places to make this experience happen! 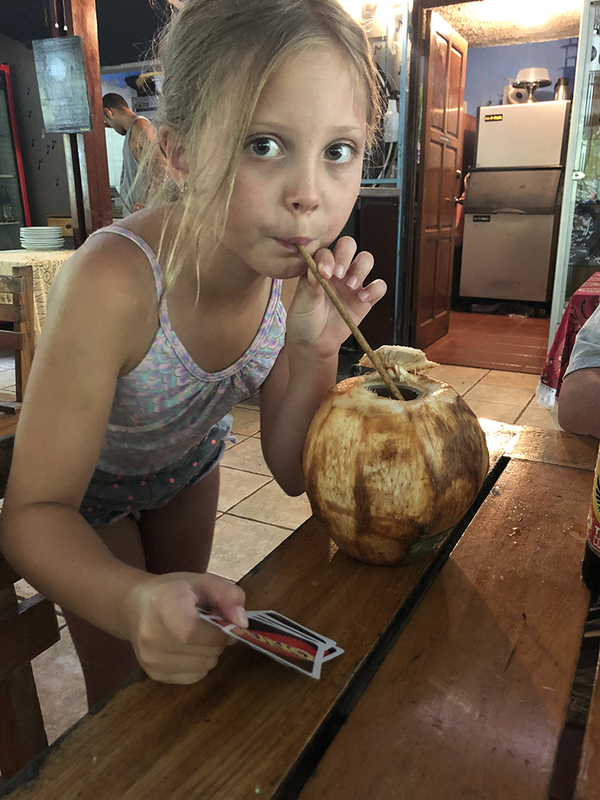 Nothing says “Pura Vida” more than a fresh squeezed juice. And the district of Nosara is well known for it’s coffee. Both are readily available. Ola Alaia was the very first store we walked into upon our arrival in Guiones. Adorable. A small space equally divided to encompass both a coffee/beer bar and a surf wear boutique, it’s comfortable and friendly. Not only does Ola have amazing coffee and beer, it also offers surf lessons and accommodations in small, brand new apartments, right in the center of town. The cuteness never stops with Go Juice, a little truck converted into a juice bar. With warm weather year round, why bother renting a space, when everyone wants to be outside anyway? Several tables and chairs surround Go Juice so guests can take a load off and the yummy juice and smoothies are super fresh! They even have ceviche. The Harmony Hotel is a wonderful little hotel tucked into the jungle and right near Playa Guiones. In keeping with the boutique hotel feel, the Harmony Hotel Juice Bar is quaint and adorable and open to guests that aren’t staying in the hotel, as well. The bar has plenty of juices, but also offers a wide variety of snacks and salads. When it comes to where to eat in Nosara, snacks play an important role! Who doesn’t have the occasional craving for a burrito when they’re hanging out with friends and family? Especially in a beach town? Before heading out to surf, stop by Nosara Burrito Company! I love tacos and burritos and consider them to be a food group. If I can find a quick burrito somewhere when hungry and in a hurry, I’m a happy girl. Similar to my craving of burritos/tacos, my love of empanadas goes unabated. Meat or veggies wrapped up in a delightful pasrty and fried? Yum. Soda El Riconcito fits the bill! Word is, they have the best beef empanada for miles around. 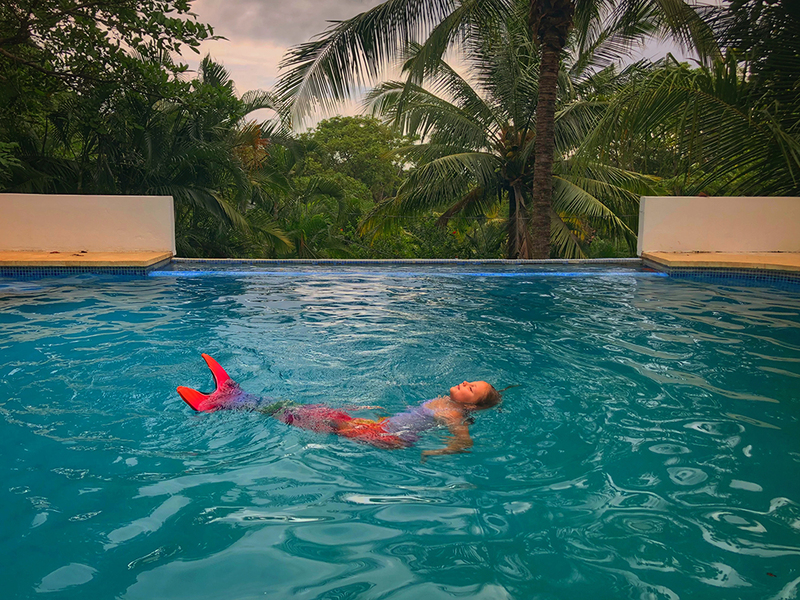 If you google Seekrespot in Nosara, literally every review talks about how unbelievable, delightful, aaahhhhzzazzing it is. Italian Gelato is never bad, but some is better than others, amiright?? It’s family owned and occasionally closed because oh, maybe they have to go surfing for an hour, but they try to give people fair warning on their facebook page. Mmmmmmmm, gelato. We had several meals in Nosara/Guiones area and, embarrassingly (or maybe not), we ate at Beach Dog Cafe several times. We were seriously obsessed with this place. Located on a dirt road on the way to Playa Guiones, the cafe is all open air and totally laid back. Even though it was 70 bajillion degrees, we were cool and comfortable under the fans, playing cards, eating yummy deep fried avocado, burger and fries. Oh and fish tacos of course! The Garden Hotel is right in Guiones and a super cool looking hotel. It had a mod meets beach vibe and we loved our dinner there. They had a good wine list also. The burger was to die for and the restaurant was all open air but not uncomfortably warm at all. 10 Pies was the dinner for us on our very first night in Nosara. So. Yummy. And a great vibe. Our table had some swings instead of chairs, which always thrills the kids and it made a really favorable impression on us right off the bat. The fish tacos were delightful. It was the perfect introduction to Nosara and Guiones. Al Chile was a restaurant we found accidentally while we were driving around looking for 10 Pies again! And we’re so glad we stumbled upon it! Amazing Mexican cuisine. The Nachos. That’s all I’m going to say. Finding where to eat in Nosara definitely isn’t hard. A compact town where everyone seems to know each other makes for an easy search. 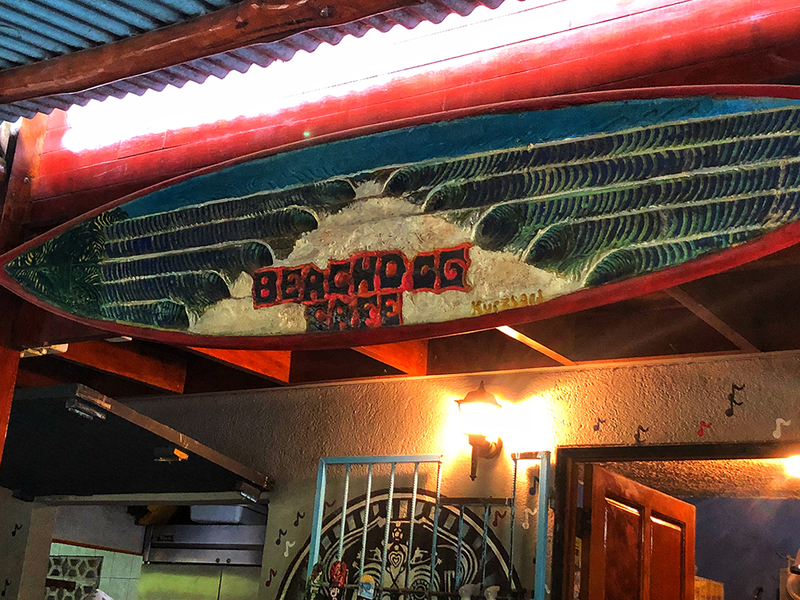 If we had to choose our favorite, it was definitely Beach Dog Cafe (which is, incidentally, owned by a Canadian who came to Nosara and never left)! 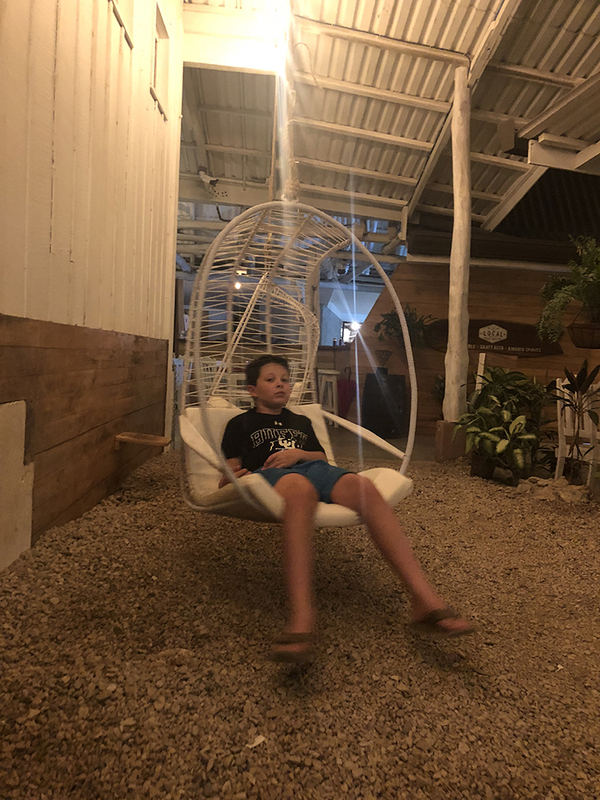 Truly, the Nosara area was a really cool place and totally encompasses all preconceived notions of the “Pura Vida” lifestyle! We spend 4 nights there and I easily could have spent another few days exploring. 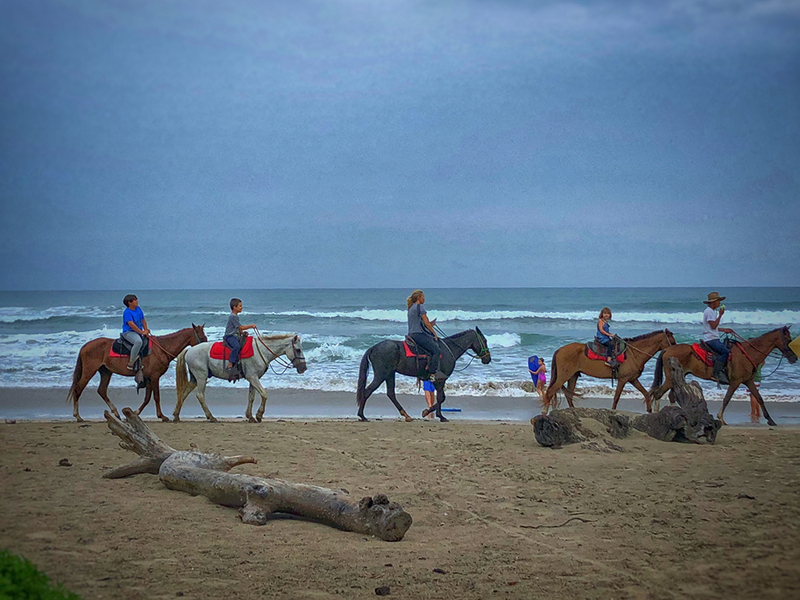 Read all about our entire Costa Rica experience here. Feeling like some Pura Vida is in your future? Contact me at mdownham@departurelounge.com and I can help you arrange! 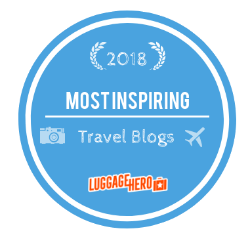 I am a Travel Advisor with Departure Lounge, as well as a travel blogger. Departure Lounge is an innovative travel agency which doubles as a wine bar/coffee shop, in addition to being an event space. Owner Keith Waldon has been in the travel space for over 25 years and knows everything there is to know about travel. Departure Lounge has independent consultants all over the world, including myself, located here in Denver. I have planned trips to Europe, Africa, United States, Central America, Asia and South America. 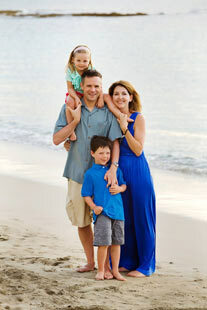 My specialty is family and couples travel.